You heard right!! Songwriting legends and longtime friends James Taylor and Bonnie Raitt have announced that they’re extending their enormously popular run of tours. Now they’re headed to the Frank Erwin Center on Wednesday 13th February 2019, each with their full accompanying band, and at some points, sharing the stage – it’s going to be a truly incredible show!! Get your tickets now, while they last. As a five-time recipient of Grammy Awards and an inductee of the Rock and Roll Hall Of Fame, James Taylor is one of folk rock and pop’s most influential and well-respected figures. His single “Fire And Rain,” charted in the top 5 in 1970, and was followed up by the No. 1 hit “You’ve Got A Friend,” written with the legendary songwriter Carole King. As for Bonnie Raitt, she has received no less than TEN Grammy Awards for her immense musical output over the years after finding fame in 1989 with her album “Nick Of Time”. With multiple hit singles to her name, she has been ranked by Rolling Stone as one of the “Greatest Singers Of All Time”. James Taylor’s most recent work, “Before This World,” came out in 2015, while Bonnie Raitt’s latest album (her 20th!!) “Dig n Deep,” was released in 2016, and she continues to tour in support of it. However, the two combined have over 30 studio albums and incredible careers behind them – meaning there’s no telling just what to expect at this show. There’s only one way to find out – be there!! 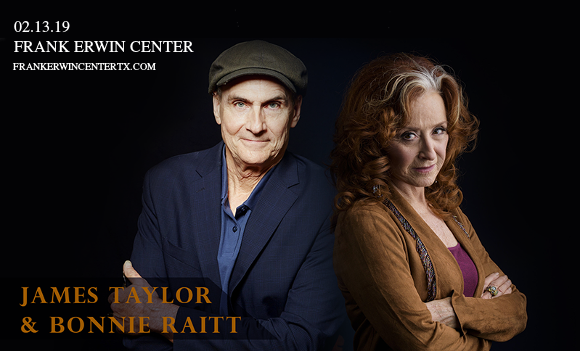 Do you have your James Taylor and Bonnie Raitt tickets yet? ?